Protect your valuables from identity theft with Lock Wallet, a lightweight, compact wallet that stores and secures your wallet’s contents from cyber-theft. As seen on TV, the Lock Wallet contains a nano-thin RFID-blocking aluminum shield that prevents scanners from reading your personal, valuable data. 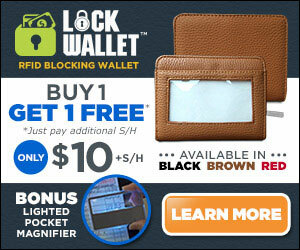 This handy wallet can hold up to 36 cards, cash, IDs and more, with full, zip-around closure for added protection. Ideal for men and women, this ultra-slim wallet protects, credit cards, debit cards, ID cards, licenses, transit cards and more from fraud. Keep your identity secure with Lock Wallet.